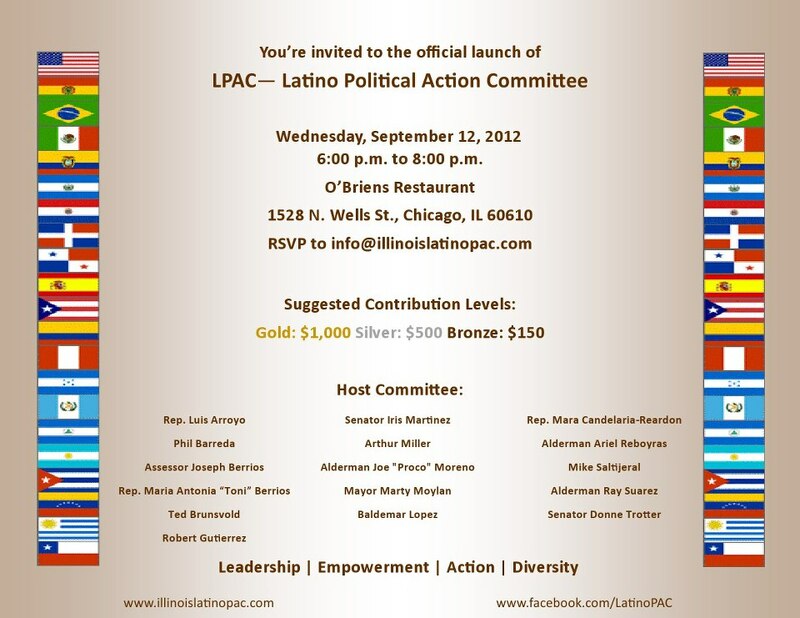 Please join me and the host committee on September 12th at O’Brien’s in Chicago as we officially launch the Latino Political Action Committee (LPAC). LPAC is a progressive organization of Latinos that was formed in 2010. Since its formation, LPAC has screened and endorsed several state, county and city candidates. LPAC is lead by an Executive Board of local Latino leaders and offers individuals and contributors an opportunity to work on advancing the political power and well being of all Latinos in Illinois.The purpose of the Latino Political Action Committee of Illinois is to raise funds for Latino, public-office candidates whose efforts support laws and policies beneficial to the Latino community and whose efforts will represent the concerns and goals of Latinos in the State of Illinois. I hope to see you there and thank you for your support. This entry was posted on Thursday, August 23rd, 2012 at 12:23 am	and is filed under . You can follow any responses to this entry through the RSS 2.0 feed. Both comments and pings are currently closed.